Categories: Pandharpur, Panduranga, Panduranga Bhaktas. We conclude the Panduranga bhakta quiz series this month with Sant Jnaneshwar, a great devotee who was indeed an incarnation of the Lord himself. Happy learning! 1. What did Lord Panduranga tell Sant Jnaneshwar’s father Vitthoba to do? come and meet Vitthoba the next day morning. 2. Vitthoba left his wife and went away. Where did he meet his Guru and take up sanyasa, without telling him that he had left his wife behind? 3. Name the Guru of Vitthoba who initiated him into ascetic life. 4. Where did Ramananda happen to meet Rukmini, Vitthoba’s wife? 5. 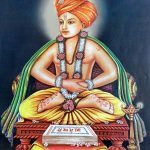 What did Sant Ramananda ordain Vitthoba to do? 8. While writing ‘Jnãneshwari’ (commentary on Bhagavad Gita), Jnaneshwar used to read out the commentary for each verse to the ____________ beside him and only after it nodded its head in acceptance did he proceed to the next verse! 9. Name the person who lived in the same town as Jnaneshwar and his siblings who had the ability to revive the dead. 10. Charngadeva was very proud of his yogic siddhis, especially that of being able to revive the dead. But who was the child devotee who did the same thing easily simply by chanting Vittala’s name in the dead people’s ears? 11.When an angry Charngadeva came riding on a lion to take Jnaneshwar and Mukta Bai to task, what happened? 12. In which town in the state of Maharashtra is Sant Jnaneshwar’s samadhi located?